While at Portfolio Day, I received continual feedback that my portfolio was not showing my process enough. This was confusing because I started with a lot of text to explain to full story of my UX projects. However, I noticed people didn’t stay on my site long enough to read the text and skimmed the images. After gathering enough photos from my past work, I added in the text and bolded key terms for scanners. Time will tell if this method works better than my previous attempts. No matter the quality of the content, it will never be able to show my true capacity as an interaction designer (I think we can all agree we’ve seen enough generic sticky note images). In fact, nothing would be better than giving me a problem while I have a marker in hand at the whiteboard (see portfolio image at bottom). This is a similar process as other disciplines such as software engineers. They don’t get judged on portfolios; they get judged if they can’t complete a Fizz Buzz. Already, we’re seeing senior level designers without portfolios or others speaking out about their poor representation. 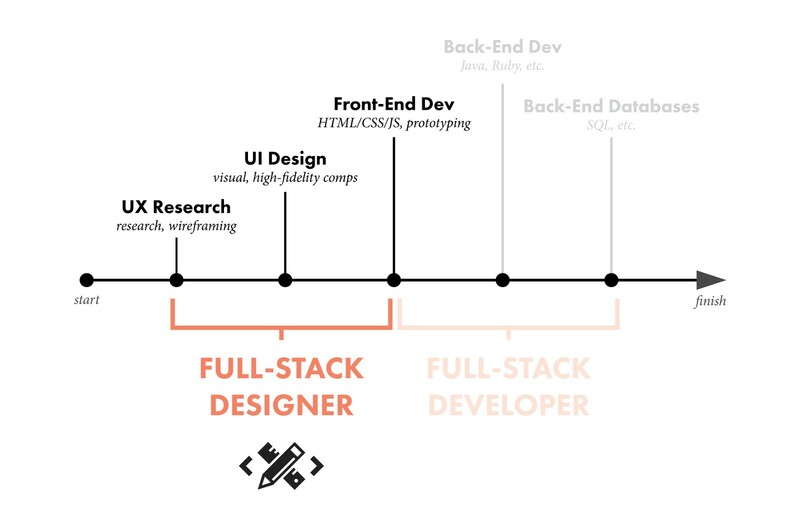 For the past couple years, I’ve talked to several designers about “full-stack” design, which is visual design, interaction design, and programming mixed or some similar capacity. In contrast, some designers are siloed, which means they only do one of the latter disciplines. Different companies seek different types of designers. Companies such as Facebook, Pivotal Labs and other startups want full-stack while Salesforce, Google or Oracle want specialist designers. Because I’d worked at startups, my portfolio attempted to show UI/UX skills, however I’ve always thought I was better at IxD and UX. They couldn’t get past their initial impression, and my content in the project sections, the most important information, was completely overlooked. 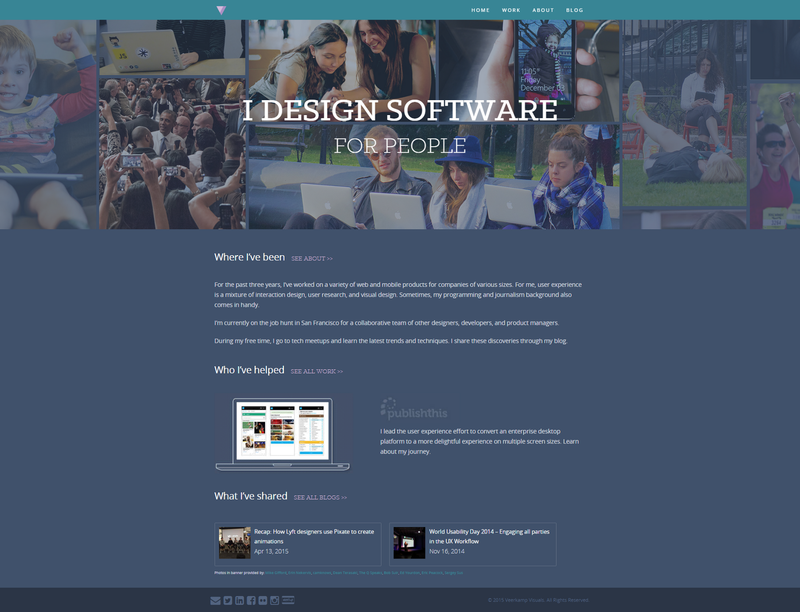 After the fourth or fifth redesign over six years, my portfolio is just not interesting to design anymore. I’d much rather be working on a cool product, someone else’s brand, or a passion project. Unfortunately, this showed in my visuals. Because my portfolio took so much time, I would continually end with half-finished designs when I thought the version was passable. I was happy with the top half of the design. The bottom half got neglected so I could spend time elsewhere, such as applying to jobs. So, I mentioned that whole “time” issue. My latest portfolio took around 40 hours to complete from visual design to changing PHP or other Wordpress code. My time would have been much better spent learning specific topics or solving problems for projects other than a portfolio. I can’t imagine the struggles designers go through that don’t know how to code. It would be impossible. 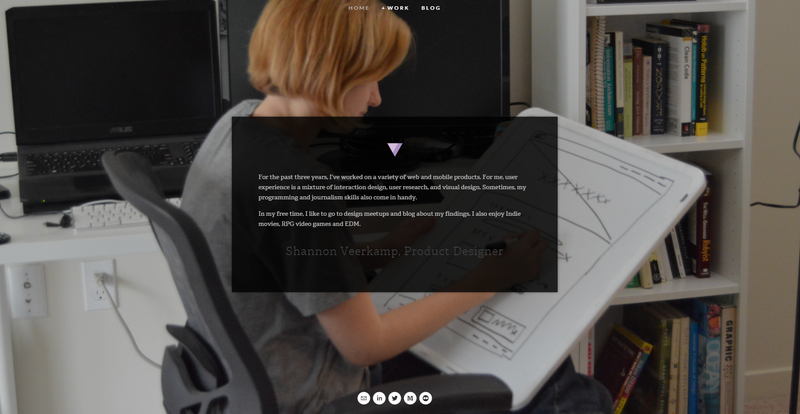 After all the years of doing custom portfolios, it was painful at first to switch to a website like Squarespace. However, I think it was an inevitable change. This time, I spent three working days on my portfolio, with the chunk of that time spent on the content in my project pages and much less time programming or tweaking the theme design. I now feel it shows my process and allows for easy updating or expansion. As another bonus, I no longer have to wrestle with Wordpress for my blogs as I’m using Medium (obviously). Going forward, I would definitely consider these arguments while working on your own portfolios. Someday, we might not have much need for them at all.